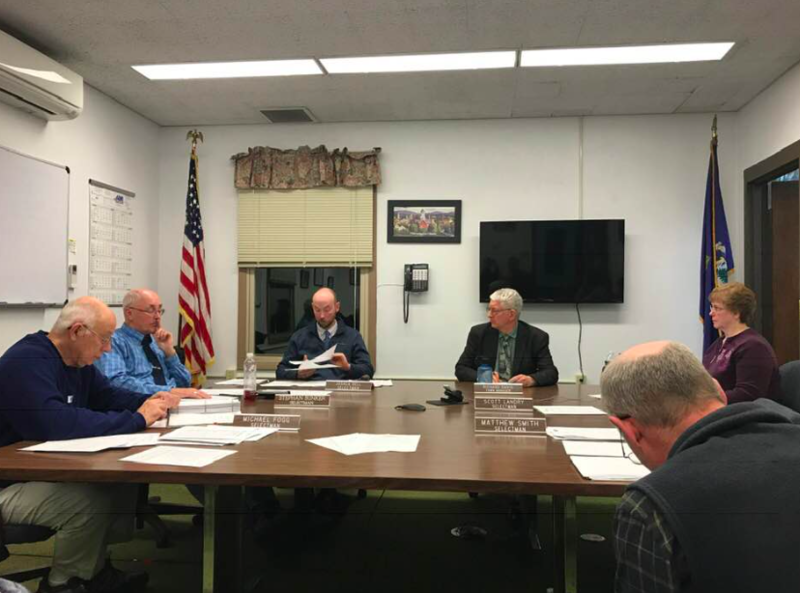 FARMINGTON - Selectmen discussed the second phase of the Front Street renovation project at Tuesday night's meeting, voting to adopt a plan proposed by Dirigo Engineering that will add a sidewalk opposite of the Farmington Farmer's Union building. The first phase of the project, which has been ongoing since September, is designed to address the frequent flooding at the lower end of Front Street with the installation of a larger culvert. A retaining wall is currently being installed to stabilize the steep slope to the left of the Farmington Farmer's Union building. Selectmen approved a change order that will add four more rows of stones to the wall that were unaccounted for in the original design. Randy Butler, project manager from Dirigo Engineering, said it was a simple mistake on the company's end. The additional rows will cost about $8,000, however, Butler said Dirigo would pick up the bill for the estimated hour of labor and the rental fee for equipment storage, bringing the total down to $7,500. The second phase, consisting of the sidewalk project and some retaining walls along Front Street, will cost $242,729. 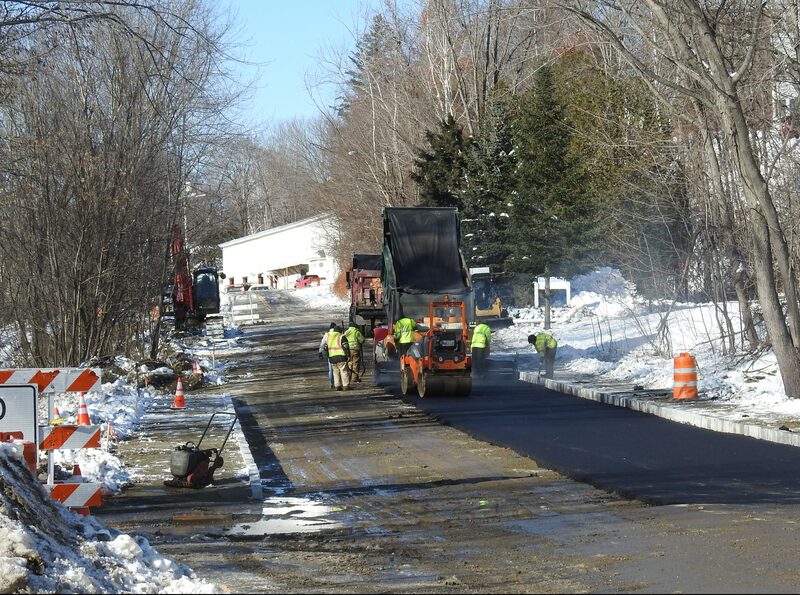 Awarded to Ranger Contracting of Fairfield, funding for phase one of the project which cost $421,402 has been funded through a combination of a Maine Department of Environmental Protection grant, town funds out of the Public Works Department budget and Tax Increment Financing funds. Ranger Contracting was the lowest of three bidders for phase one, and has operated under the impression they would continue the work for phase two of the project. However, selectmen voted to hold off on awarding any final contracts with Ranger after listening to the concern of local property owners. "I came here tonight to make sure we don't make the same mistake again," business owner John Moore said. Moore and the director of Farmington Farmer's Union, Craig Jordan, attended the meeting to share their experiences as business and property owners on Front Street. The project has gone a month longer than contracted, which is partially due to a delay for easements along with poor weather conditions, but both Moore and Jordan said that a contract is a contract. Selectman Matt Smith agreed with their concern. "I'm not saying we get rid of them, but if we do go with them again we should put in some hard deadlines. These guys are contractors. They know how contracts go," Smith said. Butler said he would look closely at the contract to make sure the language regarding a deadline is as strong as it needs to be. He will be bringing that information back to the board at next week's meeting. In addition to delays, Jordan said his biggest concern has been the lack of communication on Ranger's part. Incidences such as unexpected road closures and equipment being parked in the Farmer's Union parking lot could have easily been resolved with a preliminary conversation, Jordan said. "A local crew would have known not to work on the Saturday of Chester Greenwood. Ultimately, was the low bidder actually the low bidder? I think reputation should play a role when a low bid is given," Moore added. Ranger's bid came in at $20,000 less than the other two companies, and selectmen had delayed their acceptance to review references since the company was a new one for the town. Town Manager Richard Davis said he has a progress meeting with the company on Thursday and will go over the concerns raised at that point. Selectmen voted to delay the awarding of a contract, by a vote of 3-1. Selectman Mike Fogg voted against that decision, while Chair Josh Bell, Selectman Matt Smith and Selectman Stephen Bunker voted in favor. 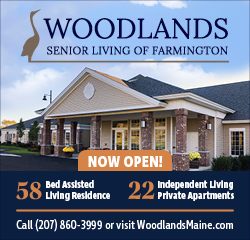 Selectman Scott Landry was absent from the meeting. A crew paving the end of Front Street in November. I agree with MD. The lowest bid is not always the best choice!! Is the road work done? If so, it's horrible! Large pot holes at the end and uneven make for bad driving on the street. You get what you pay for! I agree Ranger has performed poorly but the businesses complaints are likely unjustified. Nearly all of Farmers Union customers are loyal locals that know how to get there. I’m sure folks that want to watch a movie can find the theatre as well. Seems to me the road is not as good as it was before the job started. E.L. Vining ? The weather this fall was not in anyone's favor, excessive rain and an early onset of cold snowy conditions. I am in no way afilliated with Ranger construction, but I can clearly see they really didn't have much of a chance to prove themselves to the community. Sometimes it dont pay to hire the lowest bidder.Think there should of been a little more checking into things then there was. Quite generous of Dirigo to offer the town $500 for an $8000 mistake. How many times has this town hired Dirigo and had their project costs come in a whole lot higher than predicted? Too many!!! And the town manager paid them. The Bailey Hill project up by Ole Slide was one example. Dirigo's contract was $15,000. Before we were through with the project, I know FOR A FACT that the town paid Dirigo at least $20,000 and I believe it was more like $22,000. This town has been a cash cow for Dirigo. Why do we even need a sidewalk across from the Union? Probably because the college asked the town to put one in Bruce. I can understand why the Farmer's Union was upset by the lengthy road closure- with Tractor Supply around some people probably went there for inferior, chain store grain instead. Seems that the road closure portion of that project could have been planned and executed better, and seems like a newly paved road should be smoother and prettier. In response to Bruce- there does seem to be a lot of pedestrians along Front St when I am there. A sidewalk is probably a good idea. Other than a couple street side businesses there is nothing but parking lots across from the Farmers Union. How can you put in a sidewalk where vehicles are entering? Bruce: Actually there are lot of "local" walkers down Front Street. Some college kids, people just walking for a purpose and/or exercise, and moms with strollers. A sidewalk on Front Street was a better investment than that sidewalk on Hill Street that goes down by Hippach. I rarely see anyone walking on that.